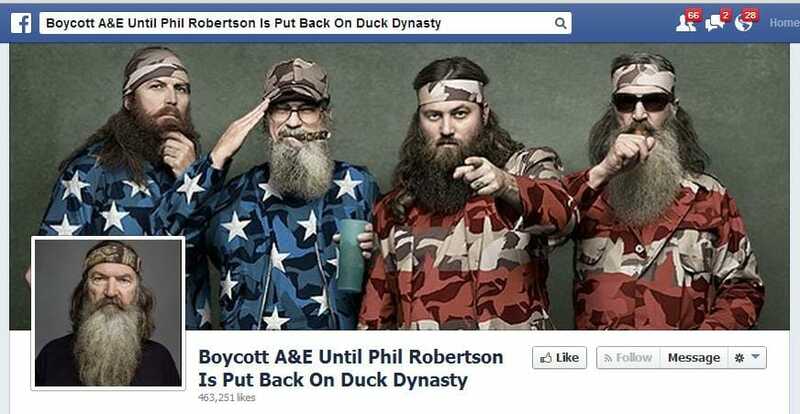 Unless you’ve been consumed by reading the fine print on Obamacare, you’re already well aware of the Duck Dynasty controversy surrounding comments their patriarch made about homosexuals and black people. I never, with my eyes, saw the mistreatment of any black person. Not once. Where we lived was all farmers. The blacks worked for the farmers. I hoed cotton with them. I’m with the blacks, because we’re white trash. We’re going across the field…. They’re singing and happy. I never heard one of them, one black person, say, ‘I tell you what: These doggone white people’—not a word!… Pre-entitlement, pre-welfare, you say: Were they happy? They were godly; they were happy; no one was singing the blues. It’s not hard to understand why people would be offended by these two statements. Many people from across the political spectrum, myself included, do not believe homosexuality is a sin. And most people accept that the segregated south was a horrible place for blacks to exist, even if they appeared happy with their sub-human status. That being said, I’m joining the #BoycottA&E movement. Why would I do such a thing after expressing my disagreement with the quoted comments? The answer two-fold. First is because the people running A&E are a bunch of cowards. Here they had a priceless opportunity to engage in what would’ve been a very honest and more importantly a compelling clash of ideas on one of todays top TV shows. Imagine if they had confronted this on air, on the show. Nobody would’ve been able to take their eyes off of it. Unfortunately A&E and American popular culture’s response to anything counter to the popular narrative is to silence the source of the undesired speech. I for one am sick of living in such a cowardly nation of people so afraid of words. I’m offended as an American patriot and as a content producer! Second, the #BoycottA&E movement actually signifies something larger. It represents the latest in a series of signs of terminal decay in left’s outrage machine. Prior there was the Chick-Fil-A buycott and then the recent #EatFast buycott in support of entry level fast food workers who SEIU is in the process of exploiting. Buycotts are so much better then boycotts but in this case I’m joining anyway. Yes, the left’s outrage machine is dying but it wasn’t a murder committed by outside forces. Nope, this is a suicide and it’s been in the making for a long time. Every time the machine was silent while Alec Baldwin went on angry anti-gay tirades, even silent as he was hired by MSNBC after publicly demeaning someone as a “toxic little queen”, they were slitting the wrists of their own credibility on the subject. The same is true for the race flavor of the outrage machine. Every time they sat silent as conservative blacks were called uncle Toms and tokens by white liberals, they have been tightening the noose around the neck of their own movement.